HomeY this is My OpenMetaphorsStageWaiting for Dessert! It all happened with a tweet! One little tweet! The advantage in Twitter is that you can direct message any of your followers whom you also follow. I was aware of Sarah Lalonde through Twitter [@sarahlalondee], knew she was podcasting regularly with Voice Ed Radio, [@VoiceED.ca] and knew that I wanted to integrate podcasting into the course in the coming term (something that I had not done explicitly before). So my direct message (see image) resulted in a flurry of responses. Sarah was quickly booked to hangout with my students in MDL4000 (Media and Digital Literacy) at the Faculty of Education. Sarah’s in Ottawa, my class is in Orillia. No problem. Hangouts work wonderfully. Sarah and I then invite the students who are interested in trying out podcasting to consider joining with her on one of her regularly schedule podcasts. Several of my students come forward at the end of class to express interest in doing this activity – this is not part of an assignment or has marks attached. Sarah and I set this up to be done during a class period where I would schedule tasks for students to investigate and explore (like a genius hour experience) and this podcast would be one of the options for students to select. 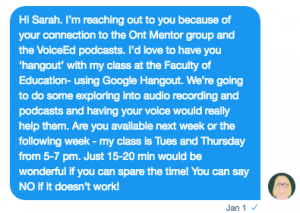 As their teacher, I figured I needed to model an open, risk taking attitude, so I accept Sarah’s invitation to podcast with her before my students get engaged with this activity. Our conversation is set up using Zencastr for a Friday night, recorded and then posted the following week [Que Sera Sarah? – Episode 35 – Helen DeWaard – Digital & Media Literacies – “Digital Fluency is an essential skill!“]. I quickly share the experience with my students and many listen as they commute to/from the faculty. 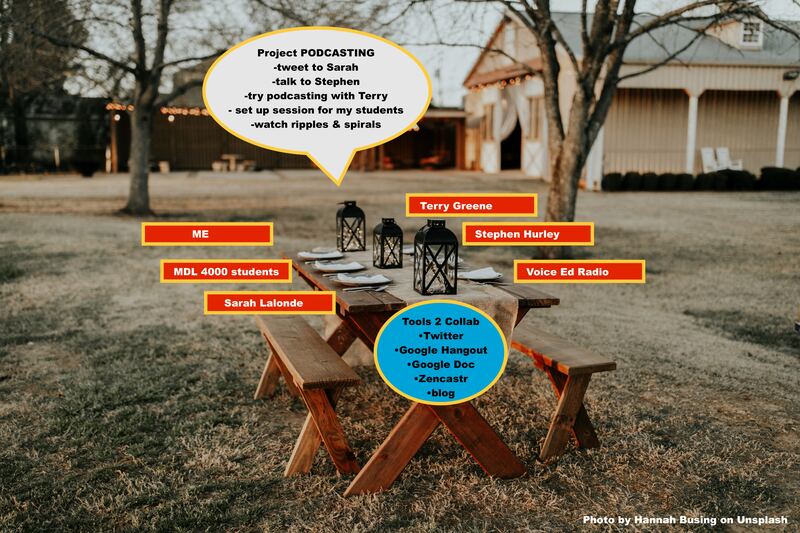 Later that week I have a rich conversation with VoicEd.ca catalyst and instigator, Stephen Hurley, about this podcasting experience, examining the power and potential for building connections and collaborative events for the students. Also during this time I accept Terry Greene’s invitation to participate in the eCampus Ontario managers podcast Getting Air. I figure if I do more podcasting, I will become more comfortable with this medium while also becoming a better model and risk-taker right along with my students. I do the podcast and then share the recording with my students. Our classroom conversations deepen. The same students who engaged with Sarah on her podcast then also become engaged in the ONedMentors podcast where they bring the voice of new teachers to the conversations. One podcast in particular was a topic of discussion in class prior to the live event – In Praise of Being Ordinary. After I have this conversation in class, and listen to the podcast, I’m inspired to blog about the topic [Finding Joy in the Ordinary and Uncommonly Ordinary]. These lead to further collaborations with other VoiceEd.ca podcasters who continue to engage and expand on the ideas explored. SO…. > my reflection on who’s at the table in this collaboration will end with the quote from the video “Where do good ideas come from“. My students are continuing to connect and collaborate beyond the ‘meal’ we shared together in January. They continue to be nourished by the conversations in engaged spaces. Podcasting, it turns out, was only the appetizer! Dessert is yet to be served!